TEL AVIV — The ongoing proxy war that Iran has been waging on Israel for years exploded into open, direct confrontation last night when Iranian forces reportedly fired a volley of about 20 rockets aimed at IDF positions in the Golan Heights. The events mark the first time the IDF has accused Iran of directly firing rockets into Israel, and the massive Israeli response represents the largest IDF action inside Syria since the 1973 Yom Kippur War. Last night’s Iranian rocket fire has been widely portrayed as “retaliation” for numerous airstrikes in Syria attributed to Israel targeting Iran-run bases in territory controlled by Syrian dictator Bashar al-Assad’s regime. Those repeated Israeli strikes, the argument goes, brought the Israel-Iran conflict into open military confrontation. In reality, it was Iran that fired the first direct shot at Israel. It did so when Iran brazenly dispatched an unmanned aerial vehicle (UAV) into Israeli territory in February before it was quickly shot down by the Israeli military. An IDF investigation revealed the Iranian drone, sent from the Iran-run T-4 airbase in Syria, was carrying explosives and seemingly deployed to attack an Israeli target. In other words, Iran, apparently overconfident at its gains in Syria, attempted to carry out a direct and possibly devastating strike against Israel in February. We would later learn that the attempted direct Iranian drone attack came after the astonishing Mossad operation in which Israel’s famed intelligence agency stole huge chunks of Iran’s secret nuclear archive, files which conclusively prove the Ayatollahs deceived the international community about its nuclear weapons project and signed the Iran nuclear accord under false pretenses. Regardless of which country fired the first direct shot, Tehran left Israel with no choice but to counter the massive Iranian military buildup near the Jewish state’s northern border with Syria. The billions of dollars that flowed to the regime as a result of the Iran agreement were utilized by the Shiite fundamentalist leadership not to fuel its faltering economy or invest in its own people, but to construct military bases in Syria and ship rockets and advanced missiles into that country — projectiles that could devastate Israel. This after financing, arming and training anti-Israel terrorist militias in Syria and Palestinian terrorist organizations in the Gaza Strip and West Bank. The international community largely turned a blind eye as Iran extended its military tentacles in Syria and created an unbearable situation for Israel in which the Jewish state is directly and immediately threatened to its north by the massive militant infrastructure of a regime that says it wants to wipe Israel off the map. This is intolerable and must be countered. 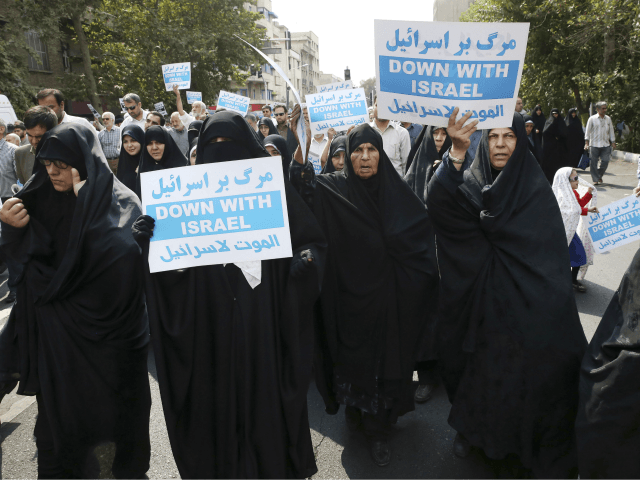 Iran left Israel with no choice but to quickly clean up that mess before it’s too late.